"Well. 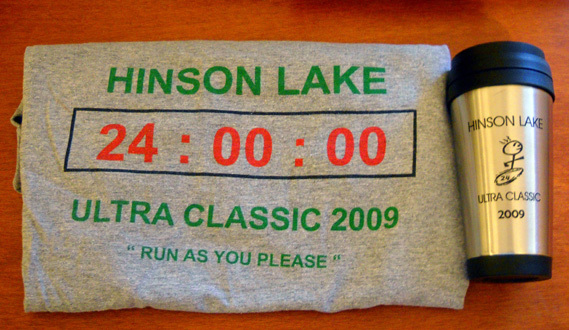 Only one more day to go before the 4th annual Hinson Lake 24-Hour Ultra Classic. for the late registered. We never thought this little race would grow so fast. But no worries. Those late registered runners still get to run in a rare 24-hour run, which is the coolest thing anyway." 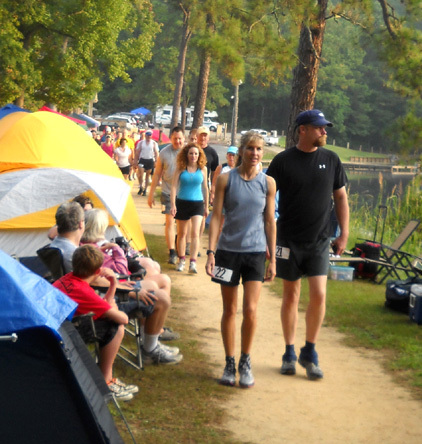 Two days before this year's Hinson Lake 24-Hour Run there were 166 registered runners from 18 states who were listed on the website. Jim and I were two of the later ones, for reasons explained in the last entry, but at least we didn't wait until race morning to register. We did wait until Friday morning to decide for certain that we'd be driving down to Rockingham, NC for the race, however. I'll talk more about that in a little bit. 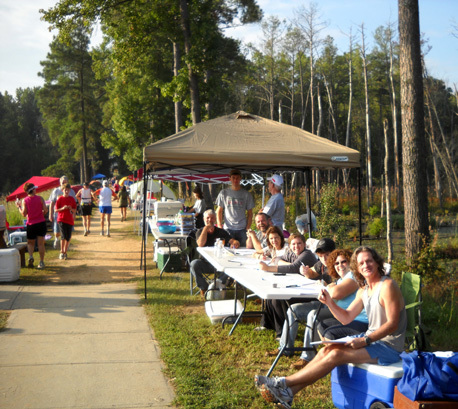 If you scroll down the 2009 race results page, you'll see why Tom was concerned about running out of shirts, handsome insulated cups with the race logo, and aid station supplies: by race morning there were a whopping 215 people registered for the race, 194 of whom toed the starting line! Two of t he late entrants were from Germany. I don't know if any additional U.S. states were represented than those in the original list. Not bad for a race that began with only 67 participants four years ago! I'm not counting the last two folks that Tom lists in 2006 that he describes as "some lady" and "some little kid" he met on the course!! That's funny, and indicative of how low-key this race is. I don't think they were officially registered. Jim and I missed the inaugural year of this race in 2006. We hadn't caught the 24-hour bug yet. 2007 saw 100 official starters in the race, a 49% increase over the first year. It grew to 138 in 2008, an increase of 38%. We did run the race both those years, as training runs for the ATY (Across the Years) 24- and 48-hour races in late December. 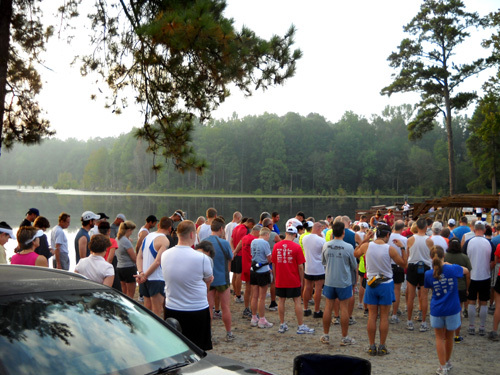 This year saw over a 40% jump to 194 participants at Hinson Lake. 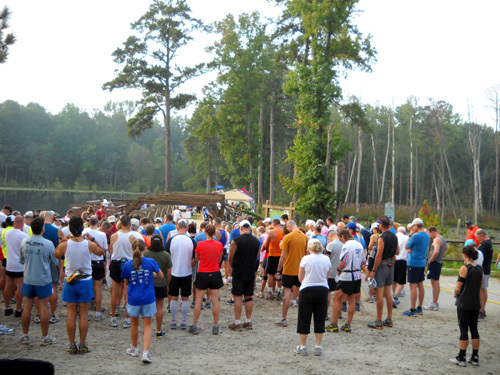 Runners gather at the start. I'm not sure if this type of increase in numbers is the stuff of race directors' dreams or nightmares but Tom, his wife, and other family members are very cool about it. If they were concerned about being overwhelmed on race day they'd either set a deadline to register or limit the number of entrants, whichever came first. When I asked him if he'd limit the number of entrants next year, Tom said he didn't think he'd need to. So far he and his volunteers have been able to keep up with the annual increases and there apparently is no limit to the number of folks the city will allow to run and walk around its beautiful lake. It's probably one of the best economic stimuli in this town besides stock car racing. This race is a gem. As it gets increased publicity from satisfied customers, more and more people come out to discover what's so special about it. 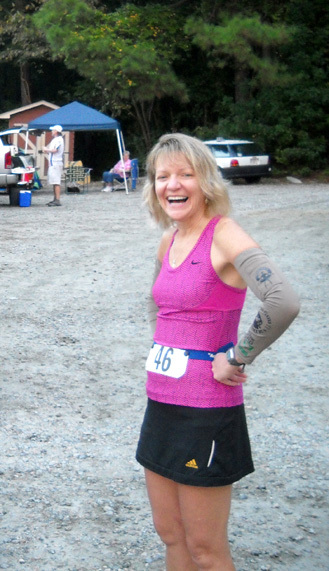 Jim and I can take credit for a little bit of the publicity because of this website, our Picasa photos from the last two years of the race, my posts to the ultra list about the race, and off-line letters I've written to runners inquiring about it. 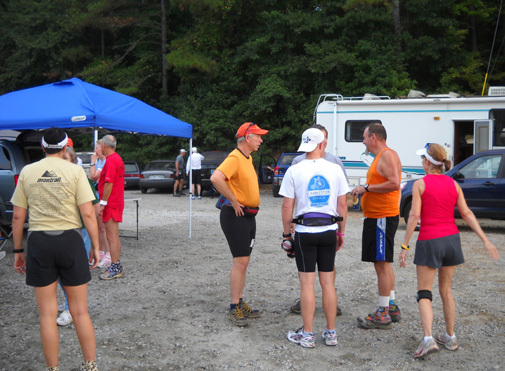 We were pleasantly surprised at the race this year when several people introduced themselves to us and said they appreciated all the information we'd made public about Hinson Lake; it helped them decide to experience it for themselves. They are converts now, too. 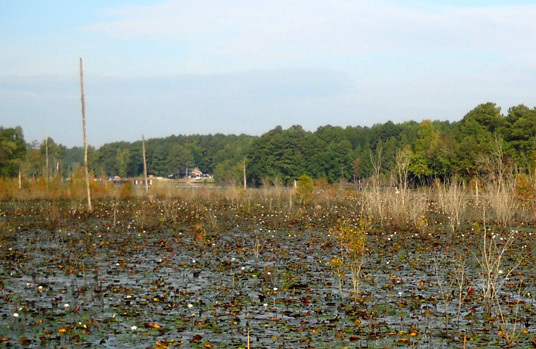 What amazes me is that Hinson Lake still "feels" the same to Jim and me each year, even though it has doubled in size since we first ran it three years ago. Don't worry; runners quickly spread out by the end of the first loop. Before the race Tom crunched some numbers from the 166 registered runners he already knew about. Two-thirds were men, one-third women. The average age for both sexes was about 46 years old. On race day the ages ranged from 7 to 72. Over half were course "virgins" (first time at Hinson Lake) and over half were from North Carolina, many of them from local communities. I think it is very cool when an ultra draws so many people from nearby. I'll talk more later about this couple and their five kids, age 8, 9, 10, 14, and 21, who ran the race this year. (Not sure how they all fit into that camper!) An 18-year-old son was also registered but didn't run this time. Various family members have run the race since its inception. Although we have a camper, it's kind of a hassle to take it out for only two nights. We've always driven our Honda Odyssey minivan to this race and slept at one of the motels in Rockingham on Friday night. We get a room with a refrigerator and microwave so we can prepare our own supper on Friday night (there is no official pre-race dinner) and breakfast on race morning. We can nap in the van if we want during the race on Saturday night; then we drive home on Sunday after everyone finishes the race. Jim and I didn't fully commit to attending this race until Friday morning, only a couple hours before we left our house in Virginia for the four-hour drive south to Rockingham. I think that's a first for us. And yes, we forgot some items we wish we'd taken!! who did a great job keeping tabs on all the runners. Because of the family medical crisis I mentioned in the last entry we ended our summer trip out West three weeks early. 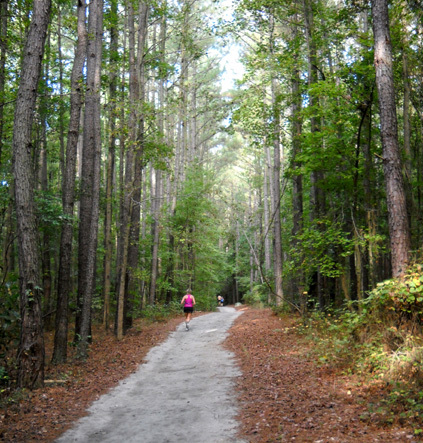 Jim wanted something in late September to fill the void of The Bear 100 and give him a long run before Mountain Masochist (MMTR) in early November. Hinson Lake provided an easy opportunity since we could enter it shortly before the event, it is only half a day's drive from Roanoke, and it is inexpensive. I certainly wasn't ready for an ultra after so little running post-bike crash, and the flat terrain isn't very specific training for Jim before MMTR . . .
. . . but we love this race for all the reasons above and we wanted to see lots of friends on the entrants' list that we haven't seen for a while -- Joe and Hannah Lugiano, Juli and Val Aistars, Susan and Fred Dummar, Pete Stringer, Mike Melton, Cheryl Lager, Tom Adair, Winston Davis, Bill Keane, Mike Brooks, Bill Gentry, Mike Day, the Kirk family, Larry Robbins, Christian Griffith, Bryon Backer, Marie Lewis, Rick Spencer, Doug Dawkins, the Gabels, and southern ultra "legends" like Doyle Carpenter, Ray Krowelwicz, and Gary Cantrell AKA "Lazarus Lake. 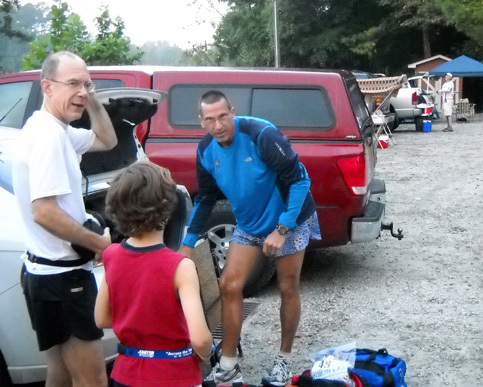 David Lulkjak (white shirt), and his 8-year-old son Peter talk with Mike Melton before the race. Still, the week before the race we had ambivalent feelings about going. We'd just gotten back to our house after being gone for four months. We were tired from all the driving, unloading the camper, getting reorganized and reoriented in the house, attacking the unkempt gardens, etc. I mean, we're definitely not 35 any more! And what's this -- rain predicted for Rockingham over the weekend?? We remembered the uncharacteristic mud and ruts on the course last year from the massive storm the area got a few days before the 2008 race. Tom, his buddies, and the city of Rockingham had tried valiantly to repair the extensive damage but it was still more of a challenge to run than it was the year before. Would the crushed rock trail be a mess again this year? Would we be miserable running and walking in the rain? Were we really up for this??? we wondered. she always wears a big smile whenever we see her! When Friday dawned bright and clear in Roanoke, and the prediction looked better for Rockingham's weather on Saturday, we remembered all the fun we've had down there before and said, "Let's do it!" We set about packing the car without our usual lists of what we needed. Although we forgot a few items like Jim's sun shirt and sun hat that we could have used during the race (we were apparently still in rain mode), we remembered the most important things -- including Cody and all his doggie stuff. We made do with what we had at the race and we're very glad we went. Oh, and the course was in the best condition we've ever seen it. The city (and volunteers?) do a fine job of maintaining it. I set my personal bar so low for this "race" that I had nowhere to go but up! That wasn't just a psychological tactic, it was my reality. In the six weeks since my bike crash in Silverton, Colorado, I had run and walked an average of only 22� miles a week. My longest run/walk was 16 miles. The entire month of August my total mileage was only 76+ miles, the lowest distance I've run and walked in one month since I had foot surgery five years ago. My highest week in September was 43 miles, just before leaving Teton Canyon in Wyoming. Not only was I more "rested" than "trained," I was trained for mountains and high altitude and cool, dry air, not a flat course at an elevation of 211 feet with 85-degree heat and what felt like 110% humidity. Jim faced the same situation, of course. Juli is dwarfed by the tall trees, which fortunately provided lots of shade during the race. It doesn't help that I have no solid race plans this winter and, therefore, less motivation to crank out mega miles. 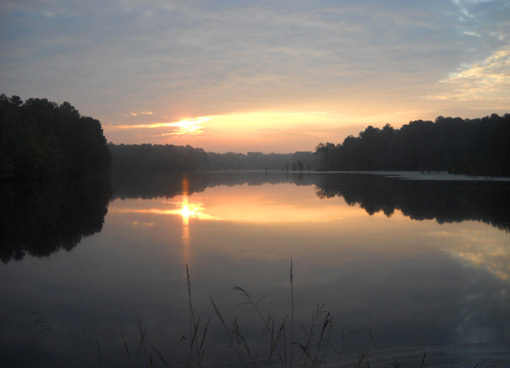 Previously, I've used Hinson Lake as a training run for ATY. Each year I have been under-trained for Hinson Lake because of injuries but have exceeded my expectations by feeding off the energy of the other runners, resting as needed, and simply plugging along as best as I could when I was out on the course. That same MO got me to 35 miles this year when I expected 20 or less. I hope I don't regret it. Jim was much better trained for Hinson Lake than me. His mileage has been consistent all summer, he just finished the Grand Teton 50-miler two weeks ago with a good time on that mountainous course, and he has plans to run several races this fall and winter. He had more reasons and motivation than I did to run well at Hinson Lake. With Mountain Masochist (MMTR) and his winter fixed-time races in mind, Jim planned to do a solid, steady 50 miles, then decide how many more miles he could rack up. He has plenty of time to rest before MMTR so a 24-hour effort shouldn't hurt him. He went hard enough that first 50 miles to decide to take a nap during the night and resume running in the morning. He ended up with 57+ miles, placing 56th out of 194 participants. Not a bad training run. 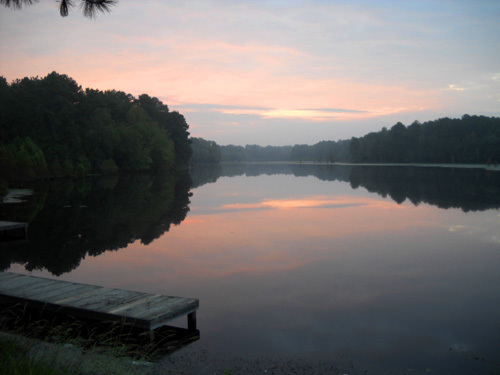 We had an enjoyable, uneventful ride down US 220 to Rockingham, NC on Friday afternoon, arriving in plenty of time to check in to our motel, go to Tom's house to get our race packet, and walk one loop around the lake. Here's something interesting we learned, thanks to a bad experience the Dummars had at the Tahoe Rim race in July. If I remember the story correctly, they found a significantly cheaper rate listed on the motel's marquee when they arrived than what they'd booked in advance with a special discount. The motel wouldn't give them the lower same-day rate so Fred "out-ed" them on the ultra list. Jim originally made reservations for Friday night on the motel's website a few days before the race. When we thought on Wednesday that maybe we wouldn't go, we cancelled the reservation without penalty and crossed our fingers that we could still get a room there if we decided to go down at the last minute -- and maybe even get it cheaper. The sunrise continues to morph. When we arrived at the motel Friday afternoon, Jim pulled out the laptop to see what rate he could get online. He put in our various discount categories to compare rates for Old Pharts, government workers, AAA members, etc. While he was doing that, I went inside to see what rate the desk clerk would give us. She said there was only one room left that met all of our criteria (no smoking, queen or king bed, microwave, refrigerator). The cost was higher than our original rate, which was different than what the Dummars experienced. Uh, oh. Maybe we screwed up! I said to myself. I went back outside to tell Jim the quoted price. Turns out, he found an even better same-day rate on-line than we'd gotten earlier in the week on the internet -- and a lot better than we could get at the desk. We cut it very close, however. There really was no more room at the inn that night . . .
After that bit of stress, we carried what we needed into our room and headed for RD Tom Gabell's house. Instead of doing all the race check-in at the lake in the morning as he's done previously, he was able to keep most of the runners' bags at his house and have a more casual registration process this way. All of us still needed to check in with his wife and her helpers on race morning, however, so they'd have an accurate count of runners in the race. Then we drove to the park nearby and walked the 1.52-mile loop around the lake with Cody. A few other runners were checking out the venue. Man, was it muggy! We knew we were in for a hot, humid race on Saturday.